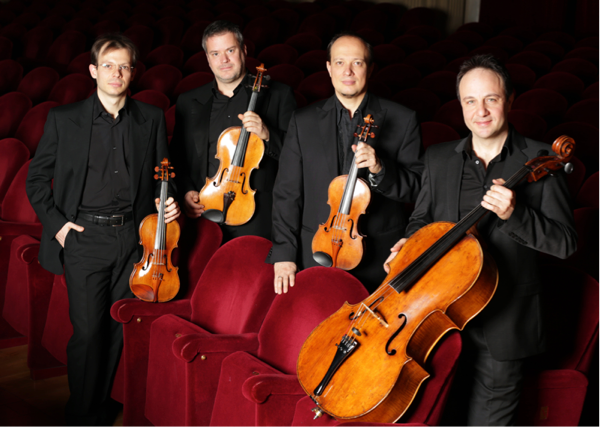 The La Scala string quartet lived up to their impressive reputation and immediately captured the imagination of the audience with a sumptuous performance of Puccini’s I Crisantemi (The Chrysanthemums – a symbol in Italy of death and morning). Known and loved for his operas, Puccini wrote little instrumental music but was inspired to write this elegy in 1890 after hearing of the death of Duke Amedeo of Savoy, a member of the Italian royal family. The music takes the form of a da capo aria and Puccini later reused both melodies in his opera, Manon Lescaut (1893), the first for Manon’s death scene and the second for an earlier poignant moment between Manon and her lover. The performance was full of colourful and expressive nuances while remaining compelling in its intensity. The players, each of them excellent soloists in their own right, moved together as one and the sudden pianissimos in particular left the audience spell-bound. The other two works in the programme – the string quartets by Ravel (1903) and Debussy (1893) – are often performed together and there are certainly several similarities. Both works feature a cyclic structure where the main themes recur throughout the quartet giving a strong feeling of unity. The middle two movements swap places, the second of each being a scherzo, dominated by pizzicato and the third, a slow movement, demonstrating a dreamy, Impressionistic style. Ravel was influenced by Debussy’s quartet and used similar techniques but was more concerned with craftsmanship and using formal classical structures than with being innovative. However, in this way he pioneered the way forward for the neoclassicists of the 20th century. Ravel’s quartet was played first and it was interesting to hear the similarities in the scherzo between this and Britten’s Simple Symphony, written in 1934. The ensemble produced a wonderfully warm, sonorous sound and conveyed the exciting rhythms and textures with an exuberant energy that at times was quite electrifying. Here is a short clip from the end of the pizzicato scherzo. Both composers wrote only one string quartet and were influenced by art and music from the East. They used modal scales to create magical melodies and sensuous harmonies, leaving the classical traditions of melody and harmony construction behind but without straying into atonality. Debussy, the younger and more adventurous of the pair was influenced by Jarvanese gamelan music, which he first heard in 1889 at the World Fair in Paris. His interest in the gamelan led him to use parallel chords and octaves as well as the pentatonic, whole tone and Phrygian modes, creating timbres and a kaleidoscope of colours that stir the imagination and evoke a feeling of mystery. Pierre Boulez described Debussy as freeing chamber music from ‘rigid structure, frozen rhetoric and rigid aesthetics.’ In this way he broke away from the classical traditions of harmony and structure and pushed forward into the 20th century. The quartet was performed with a refreshing and youthful dynamism, emphasising the magical originality of the piece.